BALDNESS seems to be the fear of all men. Here is the newest remedy for that fear. The new motor-driven scalp exerciser is guaranteed to give the scalp all the exercise that it needs. Scientifically the principle that this machine exemplifies is correct. Since blood is the food on which all the tissues of the body feed, the supply must be kept fresh and plentiful. Exercise will draw the blood to that portion of the body that is being so developed. The scalp does not receive sufficient exercise to warrant the growth of hair and as a result baldness ensues. To overcome this condition, the use of hair tonics became common. The chief value of any tonic is the process of application. The rubbing that is always prescribed makes the blood circulate and thus helps the hair gain new life. 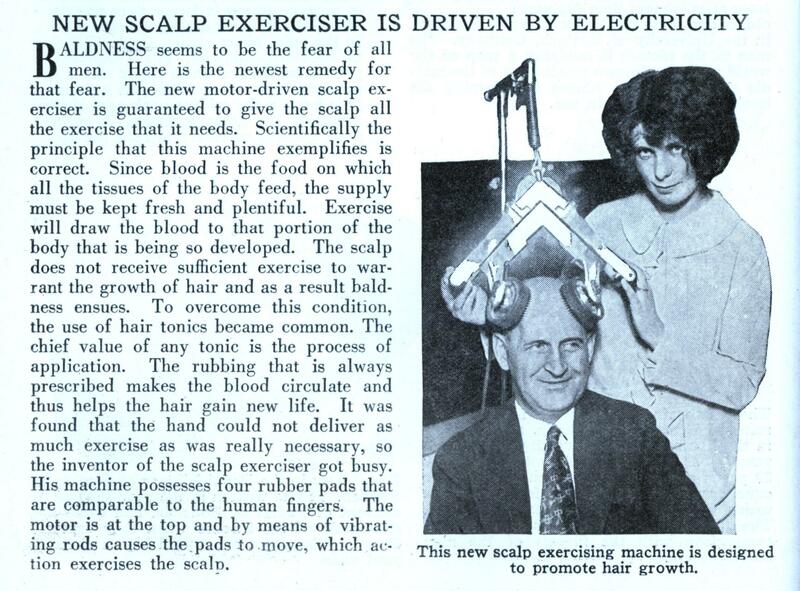 It was found that the hand could not deliver as much exercise as was really necessary, so the inventor of the scalp exerciser got busy. His machine possesses four rubber pads that are comparable to the human fingers. 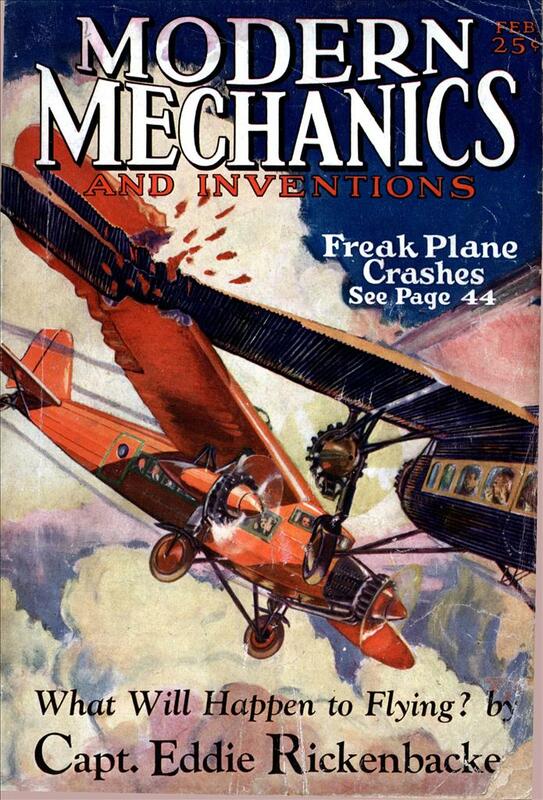 The motor is at the top and by means of vibrating rods causes the pads to move, which action exercises the scalp. Once again, truly an amazing photograph. I think the woman there used it a tad too much. That is just disturbing. Is it electro-shock? 90 years later and there are still scams to cure the balding head. Come on, take a deep cleansing breath and read the article! It doesn’t say anything about electro shock! It’s a motor driven massager. 90 years later and people still assume facts not in evidence. Inventors name was Hassler by the way. He patented a whole series of these devices. Not disturbing at all, it rubs your scalp. They missed the boat on baldness cures, but at least they anticipated Young Frankenstein and Rocky Horror Picture Show. Settle down, I was making a joke that it looks like electroshock, it looks like the doctor was getting electroshock and the patient was standing behind him. mike: Naw, that couldn’t be it…jokes are funny! Hmmm… Maybe it’s just my mind, but have anyone noticed, how much those rubber pads resembles rocksheet hole cutters…? Muuuuuuuurrrrr… err I mean come to me, bride of Frankenstein! I’ll have a shiny new scalp in a flash!